Well its almost here. For those of you who don’t remember when V’Havienu first appeared in your local judaica store it was back in the summer of 2004. The album was fresh and different and people like it. The english song “Pesach In The Ghetto” got a lot of peoples attention. Then in Chanukah of ’06 V’Havienu 2 was released. Intrestingly enough it included a “V’Havienu” song just like on the first. Its a intresting consept to have a song on both albums with the same word just different tunes. 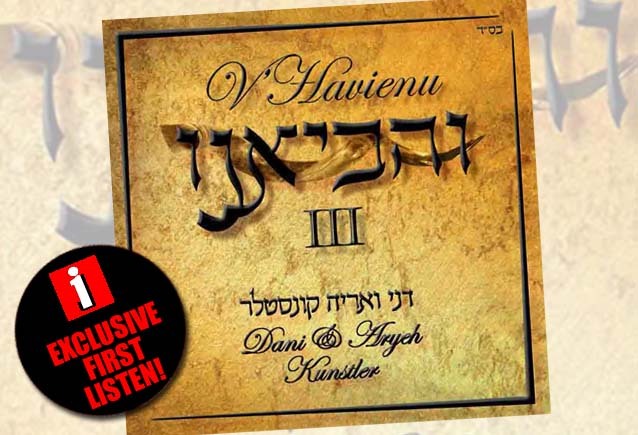 Now its almost time for V’Havienu 3. this time featuring only the Kunstler brothers Dani & Aryeh. The style will definatly be similar to the first two with some changes. On this album Aryeh Kunstler does all the guitars instead of Avi Singolda so there is a very new sound from that standpoint. Aryeh as well does all the bass too. This album will feature a new song from both Aryeh and from the duo’s father Avi, plus a few composed by the brothers together. Enjoy your first listen and keep it here for the release date!